Make the most of being stuck inside with this fun and delicious treat. You’ll love to enjoy it on a rainy day. Just as delicious as the classic. It’s the perfect solution to an evening snack party during monsoon. A cup of hot tea or coffee paired with this yummy dish while looking at the downpour is very relaxing and comforting! Boil and peel potatoes. Mash them when warm. Add corn flour, breadcrumbs (grind bread slices in a food processor) and lemon juice in warm mashed potatoes and mix well to make a stiff dough. For stuffing, heat one tablespoon of oil in a deep pan. Add washed and soaked (for two hours) chana dal, peas and grated carrot in it. Mix well and cover the masala to get cooked on low flame for 10-15 minutes. Turn off flame and let the masala get cold at room temperature. Make small balls out of potato dough. Press the balls placing them in between your palms and flatten them gently. Put one and a half teaspoons of masala in the centre. Close the edges and give a round shape again. Flatten it little with the help of your palms. Deep fry the tikkis at an appropriate temperature till crisp and golden brown. Take them out on a kitchen towel to soak excess oil. While serving place a tikka in a plate. Sprinkle little chat masala on it. Put little beaten yougurt, tamarind chutney and coriander chutney on it. Garnish with sliced onion lachcha and pomegranate seeds. Serve hot immediately after making. This evening snack recipe will make your monsoon special and memorable. 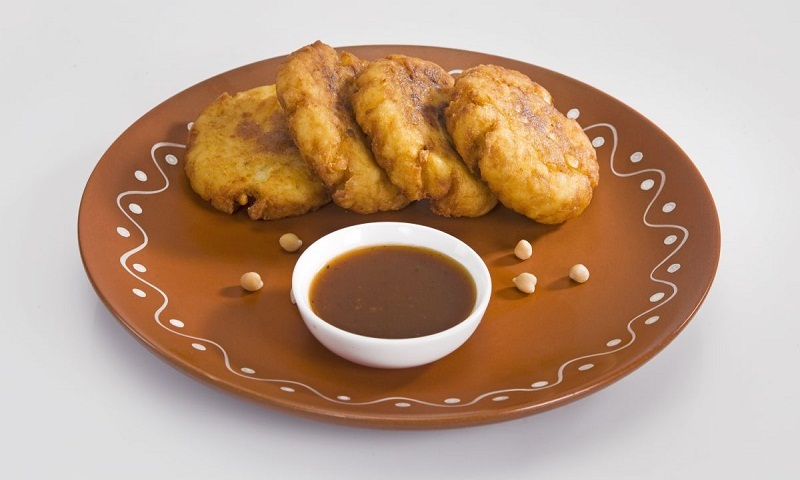 It is considered as one of the most relished of all North Indian snack recipes.